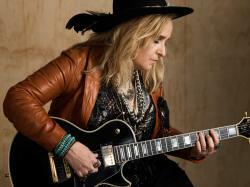 Since her 1988 debut album, Melissa Etheridge has amassed a significant body of work. Her fifteenth studio album, "The Medicine Show," caps a ten-year period in which the rocker took some musical detours. Reuniting with her former guitarist and now in-demand producer John Shanks (whose resumé includes Stevie Nicks, Bon Jovi, Miley Cyrus, and Van Halen among many others), the new album is billed as a return to form. Shanks and Etheridge last worked together on the artist's 2010 album, the hard-rocking "Fearless Love." In the time since, Etheridge released a couple of albums that altered her sonics — the criminally overlooked "4th Street Feeling" in 2012, and the contemporary pop/R&B-informed "This is M.E." in 2014. Following such bold moves, "MEmphis Rock and Soul" (in 2016) found Etheridge belting new renditions of covers such as B.B. King's "Rock Me Baby" and Otis Redding's "I've Got Dreams to Remember," and other choice selections that clearly influenced her own style. Lessons learned from these four albums inform "The Medicine Show." First and foremost, Etheridge has always branded herself as an artist with a message. Earnest lyrics are characteristic of her style, which can be both endearing and frustrating. To be fair, this trait appeals to Etheridge's devoted fan-base because such frankness (and with the absence of irony) is often equated with heartfelt truthfulness. She nets some truly effective moments here. For instance, in "Here Comes the Pain," an acoustic guitar-centered ballad about the opioid crisis, Etheridge captures the psychology of an addict taking solace in escape: "And it feels like kissing Jesus as it melts into your veins / When the whole damn world is busted there's no need in being sane." But such lyrically rich moments are often counterbalanced by sentiments in common, cliché terms that sometimes verge on clumsy. "Woman Like You" tediously invokes self-help in summing up a lover: "You want a stairway to heaven but you won't take the journey one step at a time, too long a climb." That said, there is no doubting Etheridge's sincerity and eagerness to connect emotionally with listeners. In terms of sound, "The Medicine Show" is noticeably edgy. The electric guitars are a bit more distorted, the tempos are mostly middle of the road to full-on rock, and there's an eclectic nature to Etheridge's songwriting that doesn't really detract from the album's overall consistency. The title track, a mostly two-chord sing-along, opens the album with the hammer of the gods drumming and heavy electric guitars, drenched in reverb. It's an adrenaline pumping, pro-cannabis anthem sure to become a highlight of her upcoming tour. Other anthemic rockers include "Shaking," which details the struggle to overcome anxiety, and "Love Will Live," about the turning point where overcoming pain becomes a possibility. Many songs also recall the artistic and commercial breakthrough of Etheridge's 1995 album "Yes I Am." Songs such as "Wild and Lonely," "Faded by Design," "Here Comes the Pain" and "Suede" feature her signature acoustic guitar paired with highly emotional and reflective lyrics. For instance, "Wild and Lonely" is reminiscent of "Come to My Window" but without ever feeling like a second-rate knockoff. The result is quintessential Etheridge, a moody rock track working up to a mid-song electric guitar solo mirroring the longing in her lyrics ("A raging hollow emptiness I feel, the night is cold and I'm alone, come take the wheel... and I feel so wild and lonely, don't you want to save me? Don't you want to stone me?"). Thankfully, Etheridge's writing is strong, elevating these songs above mere attempts to replicate a commercially successful sound from her past. The album also contains a clutch of problematic moments in the form of "I Know You," "Last Hello," and "Human Chain." Both "I Know You" and "Last Hello" share similar melodic content and strongly recall Sia's "Breathe Me." Also like Sia's, both songs build toward climactic, lush endings replete with synthesized strings that provide Etheridge musical backdrops over which to emote. Both are unnecessarily overwrought where spare musical settings would have conveyed more powerfully. "Human Chain" is a bigger stumble. Etheridge's generic commentary on social injustice ("Time to come together, time for me to see my brothers and my sisters, just another part of me") is married to a Curtis Mayfield-styled funk that blurs the line between pastiche and appropriation. These few issues aside, "The Medicine Show" is largely a fine album. Etheridge's performances are passionate and magnetic, using restraint and power in equal measure to shape any given song's dynamics. Etheridge's songwriting is served well by synthesizing her recorded past with new aesthetic approaches. Aside from moments where austerity could have prevailed, Etheridge's songs are framed by colorful arrangements and production. The end result is an eclectic album that largely holds together as a cohesive, compelling and enjoyable work.